This Quran fragment has been preserved in Leiden University Library since the seventeenth century. Its handwriting and colourful decoration indicate that it is of North African origin. Officially it is part of the bequest of Josephus Justus Scaliger (1540-1609), but the Dutch scholar Theodor Dunkelgrün from the University of Chicago has now established that it never belonged to Scaliger but to Franciscus Raphelengius, a scholar from the Southern Netherlands. In 1586 Raphelengius took the manuscript with him when he moved from Antwerp to Leiden, where he became professor of Hebrew and typographer to the University. He died in Leiden in 1597. Raphelengius, however, was by no means the first European owner of this Quran fragment. Notices of previous owners show that it was in the Southern Netherlands two generations before him. 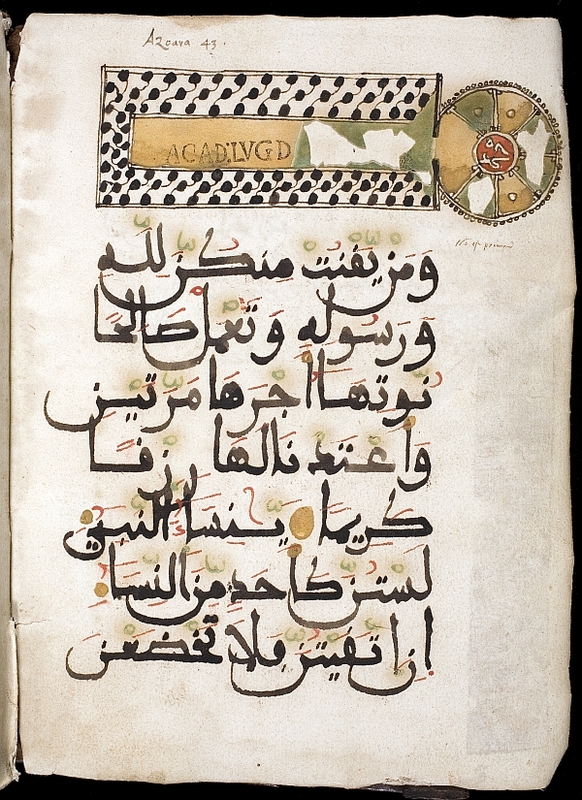 Dunkelgrün has traced the history of this manuscript one step further, presuming that it once belonged to Nicolaus Clenardus or Cleynaerts from Diest (c. 1493-1542), the first scholar from the Low Countries who knew Arabic. Clenardus wanted to study the Quran in order to challenge Islam with the power of arguments, and to this purpose he stayed in Fez, Morocco, in 1540-1541. Upon his return to Europe he was not allowed to take manuscripts out of the country, but it appears that he managed to do so nonetheless.